Senior US officials have made comments on the Middle East recently that reinforce concerns that the Trump administration will largely ignore human rights issues long considered important to US foreign policy. In his January 17 speech at Stanford University, US Secretary of State Rex Tillerson laid out the Trump administration’s Syria strategy. Yet he never mentioned US refugee or aid policy – surely integral aspects of any US strategy in Syria. When quizzed on this omission and his wider attitude to human rights by former Secretary of State Condoleezza Rice, Tillerson’s response was telling: he said that advocating human rights in the midst of a war, “doesn’t resonate very well, because the most important human right to anybody is … the right to life.” It’s a view that dismisses the full range of rights important to everyone, including those trapped in war zones. Vice President Mike Pence made similarly disturbing comments during his meetings with Egyptian President Abdel Fattah al-Sisi in Cairo this week, when he said little about Egypt’s poor human rights record. At a press pool later, Pence said that he only raised issues that fell squarely in the “America first” playbook: reforms to a draconian nongovernmental organization law that restricts civil society and the release of American citizens imprisoned in Egypt. Like Tillerson, Pence is highly selective when he talks about human rights. 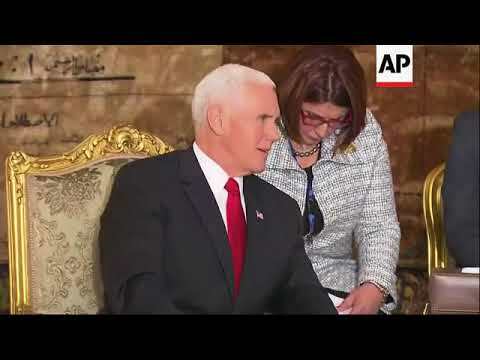 When asked if other rights issues emerged during his meeting with al-Sisi, Pence said, “We talked about … the importance of respecting religious diversity in communities. And encompassed in that is human rights of all the people of Egypt.” Al-Sisi’s track record on this is not good. He has overseen a crackdown on diversity during his presidency and just days before Pence arrived in Cairo, Egyptian police continued their campaign of persecution against LGBT people with another 10 arrests. Pence gave no indication that his talking about this issue included raising specific concerns about rights violations by al-Sisi’s government. Rhetoric matters, and leaders around the world are taking Donald Trump – and his top leadership – at their word. More than a year into his presidency, two of Trump’s senior foreign policymakers are giving short shrift to the very values and rights that the US has long considered to be in its best interests.